Success in America has always been seen as the jackpot for music acts around the world, and sometimes all the stops have to be pulled out to ensure that happens. In the 1990s, a couple of pop acts that were big in Europe had their debut album rejigged for US release, since the original versions weren't deemed suitable enough. This week in 1994, a quartet from Sweden fast-tracked a song that had been intended for their second album and whacked it onto a revised tracklisting of their debut. 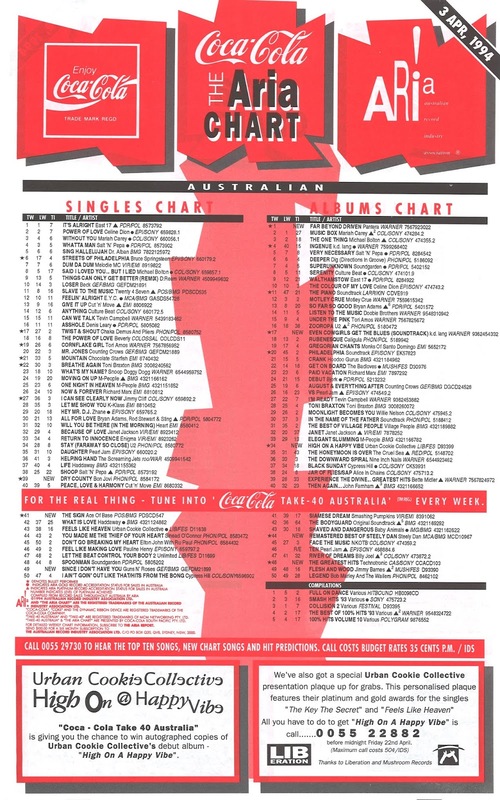 The result: a worldwide number 1, including in Australia. The number 1 single in Australia this week in 1994 was still "It's Alright" by East 17, a song that was remixed from its original album version and included on a revised release of the boy band's debut, Walthamstow. As "Said I Loved You... But I Lied" made its way down the top 10, the crooner's follow-up - a pained Diane Warren-penned mega-ballad - missed the top 50, wait for it, completely. A duet by a married couple of music superstars should have been a huge event, but this mediocre pop/R&B tune limped into the lower reaches of the top 100. The metal band's first single without Vince Neil, this lead release from their self-titled sixth album was sung and co-written by his replacement, John Corabi. Ah, The Spaghetti Incident - the bane of record stores all around the world. After the massive and long-running success of the Use Your Illusion albums, retailers ordered huge amounts of the next album by Guns n' Roses, expecting demand to be just as high... but it wasn't. Yes, it debuted at number 1 in December 1993, but it had exited the top 50 by this stage. And pretty much any CD shop (including the Grace Bros and Brashs stores I worked at while at uni) you walked into for the rest of the decade would have excess amounts of the covers album they were desperate to sell. Just when The Spaghetti Incident had run its top 50 course, a single was finally lifted from the album, delayed until the final Use Your Illusion release had been exhausted earlier in 1994. A remake of a song originally performed by doo-wop group The Skyliners, "Since I Don't Have You" might have been too little, too late. Like a pop rose wedged in between two rock thorns this week, Ace Of Base returned to the top 50, but not with any of the other singles from original debut album Happy Nation - which included songs like "Wheel Of Fortune" and the title track. Instead it was a new tune, originally planned for the follow-up to Happy Nation. US record company executives felt that album was lacking a certain something - i.e. another monster hit like "All That She Wants" - and so the grabbed this fresh cut from the Swedish quartet, and named their American album The Sign as well. 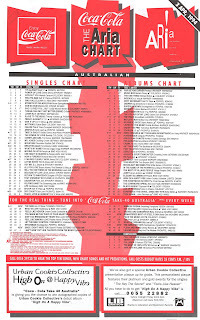 They clearly knew what they were talking about, with "The Sign" returning Ace Of Base to the top of the singles chart in Australia and the US, where it ended 1994 as the year's number 1 song. Another slice of Scandipop brilliance, the song wasn't the only new track included on what we knew in Australia as Happy Nation (US Version) - and we'll see more from Ace Of Base in the months to come. This was the stage I went from being able to hum along to every Bon Jovi single - even the ones I didn't like - to often not having any idea what they sounded like. The sixth and final single from Keep The Faith, this nine-and-a-half-minute epic (an edited version trimmed off three minutes) was, I guess, the band's "November Rain" in terms of its scale. Lyrically, it dealt with the downturn of America's oil production and the subsequent struggles faced by that industry's workers. Yep, upbeat stuff. Next week: a batch of lesser-remembered follow-ups to big hits across dance, R&B and adult contemporary. 'The Sign' was great catchy pop. From the moment you heard it, you knew it was going to be big. I had completely forgotten about 'Dry County''s existence until seeing it listed on something a year or two ago. It has always got me beat how Bon Jovi survived the '80s bands flopping as soon as the 90s rolled over' trend, when they released so much forgettable, mediocre-at-best stuff like this. Kind of re: Dry County - I always had (and still do to a lesser extent), have a strange fascination with final singles released from hit albums. They are generally always flops, but there's something interesting about how a record company chooses to squeeze one last drop of blood out of a project. It might make for a fun countdown or list in the future? It is interesting - sometimes it's just to try and spur the album on for a few more sales (oh, there are 5 tracks I like on this album, I might get it), but that doesn't always happen either. Will keep it in mind as a post topic!